The spacecraft Rosetta has met up, after a decade-long journey, with a comet orbiting the Sun between Mars and Jupiter, becoming the first vessel to do so. Comet 67P/Churyumov-Gerasimenko will have its Earthly companion for about the next year as it moves around our star. “After ten years, five months and four days traveling towards our destination, looping around the Sun five times and clocking up 6.4 billion kilometers, we are delighted to announce finally ‘we are here’,” Jean-Jacques Dordain, the director-general of the European Space Agency, said in a statement. In May Rosetta began the process of slowing and positioning itself for the rendezvous. 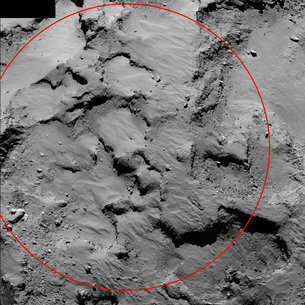 The spacecraft, which is now about 100 kilometers from the comet, will now prepare for an effort to land a probe on the comet’s surface. That probe, called Philae, is to be launched in mid-November. 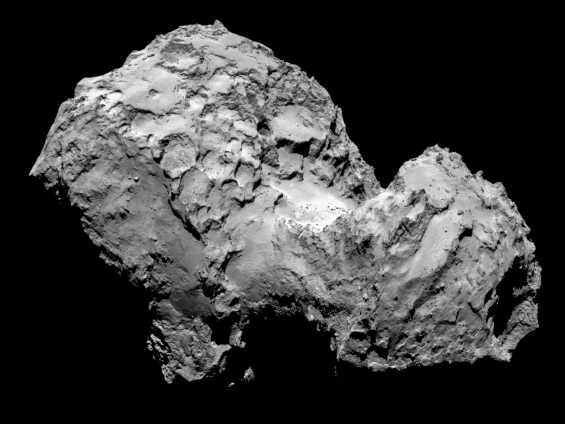 Rosetta is likely to help scientists learn about the comet’s nucleus and coma. Launched on March 2, 2004, Rosetta has flown by Earth three times, by Mars once, and by two asteroids on its way to Comet 67P/Churyumov-Gerasimenko. Comet 67P/Churyumov-Gerasimenko is seen in an image obtained Aug. 3 by the Rosetta spacecraft. 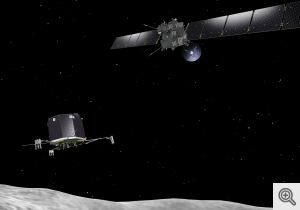 Nearly three years of quiet from a probe speeding toward a rendezvous with a distant comet ended Monday as engineers in Germany successfully reactivated the Rosetta spacecraft. The solar-powered probe is designed to be the first to land on a comet. If all goes as planned, Rosetta will accomplish that feat in November of this year when an onboard lander alights on the head of comet 67P/Churyumov-Gerasimenko. Rosetta will also follow the comet around the sun, another first for human space exploration. Rosetta was launched on March 2, 2004. During the 118 months that have since elapsed it has flown by the Earth three times and once around Mars. The probe was placed into hibernation at the command of engineers in Europe on June 8, 2011. During the hibernation only the computers onboard and heaters necessary to prevent the spacecraft from freezing were functional. All other instrumentation, including that necessary to study the comet, was shut down. The deactivation of Rosetta was necessary because the probe would travel too far from the Sun to obtain the solar energy needed to power its systems. Reactivation occurred when a timer programmed into the spacecraft’s computer system reached the previously specified time of the event. Rosetta’s star trackers were the first instruments to come back online. Then the probe’s computer system slowed the spacecraft’s spin and oriented it toward Earth in order to transmit a signal. “This was one alarm clock not to hit snooze on, and after a tense day we are absolutely delighted to have our spacecraft awake and back online,” Fred Jansen, the European Space Agency’s manager for the mission, said in a statement. Now about nine million kilometers from comet 67P/Churyumov-Gerasimenko, Rosetta will enter an orbit around the comet in May. In November, after Rosetta has had time to slow down enough time to synchronize its velocity with the comet, a smaller craft called Philae will land on it. Philae, which has a mass of about 100 kilograms, is much smaller than the nucleus of the comet. 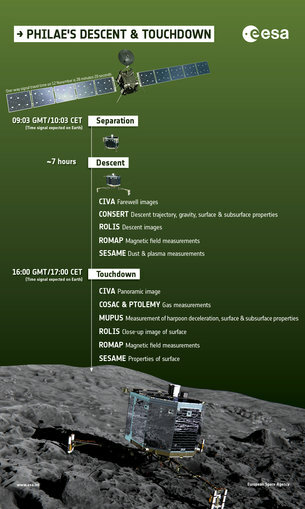 Philae will contend with landing on a surface that exhibits very little gravity. Unlike Earth, where there is enough gravity to hold soil and rock in place, the environment on a small comet like 67P/Churymov-Gerasimenko does not have enough to hold all solid material in place. The comet has about 1,000 times less gravity than does Earth. The lander will study 67P/Churyumov-Gerasimenko’s nucleus, and determine the chemical composition of the materials found there, while being secured to the comet’s nucleus by two harpoons. “We want to measure all we can, how much material is coming off the comet as it goes around the sun,” Combi said. He explained that ice is the dominant material on a comet’s nucleus, and that it sublimates, or changes phase from a solid to a gas, as the comet heats up on approach to the sun. One of the mission’s goals is to understand the mechanics of this sublimation process. 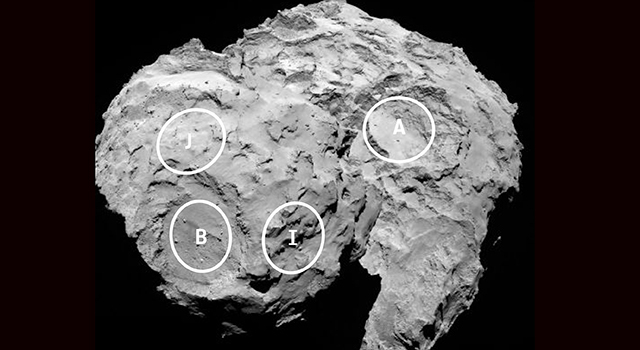 Rosetta also aims to help scientists gain a better understanding of the specific chemical makeup of comets. One unique feature of the mission will be to allow the measurement of carbon dioxide in the nucleus, a task that is not possible from Earth. Another priority will be to study the solar wind, which can produce solar storms. Composed of a stream of charged particles, the solar wind exhibits different velocities at different locations on the sun. Since Earth’s orbit takes it closest to the equator of the sun, it is difficult for scientists to study the dynamics of the solar wind at higher solar latitudes. “But comets pass through all of it. With their help, we can study the fast solar wind,” Tomas Gombosi, a professor of engineering in UM’s Department of Atmospheric, Oceanic, and Space Sciences and another researcher on the Rosetta team, said in a statement. Of course, as relics from the earliest days of the solar system, Rosetta should also provide significant insights about the distant past of our stellar neighborhood. “Comets, more than most other objects in the solar system, preserve information about the solar system when it was formed,” Gombi explained. The Rosetta mission was designed to replace a similar undertaking conceived by NASA called the Comet Rendezvous Asteroid Flyby during the 1980s. That proposed mission would have involved flying a probe alongside a comet for three years. It was cancelled in 1992 as a result of budget constraints facing the American space agency at that time. The Rosetta mission will end in 2015 after completing the orbit of the sun alongside comet 67P/Churyumov-Gerasimenko. The Rosetta spacecraft will come closest to the sun on Aug. 13, 2015, when it and the comet are about 185 million kilometers away from our star. 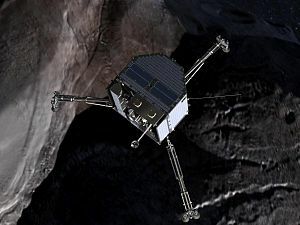 Artist’s conception of orbiter Rosetta and lander Philae at comet 67P/Churyumov-Gerasimenko courtesy European Space Agency. 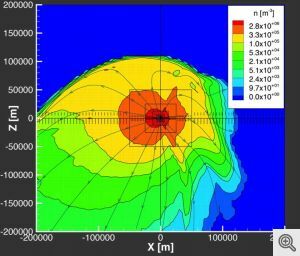 Graphic showing dust composition of cometary nucleus courtesy University of Michigan; graphic by Valeriy Tenishev. NOTE: This article also appears at Examiner.com.